I have bought quite a number of kitchen shears in the previous few years. It’s not that I adore this kitchen utensil so much that I like to stock up on it, but I have never found the ones that completely met my needs. Some very quick to lose sharpness. Others were difficult to hold. So, I have made it my mission to find shears which will help me with tasks such as trimming fresh artichokes, cutting strips of lettuce and cutting chicken, without going to waste after only a couple of months. Do you want to know if I made it? Well, you’ll just have to read this whole article which includes both buying guide that will help you learn what is important to look for in kitchen shears and reviews of products that could easily be the best kitchen shears on the market. What To Look For When Buying Kitchen ﻿Shears﻿? Is There More Than One Way To Use Shears In The Kitchen? What Else Can You Cut? As you’ve probably noticed so far, I had the most problems with the durability when it comes to kitchen shears. So, from now on, the first thing I check out is the material the shears are made of. Usually, you can choose between carbon steel and stainless﻿﻿ materials. I prefer stainless blades because it proved to be more rust and stain resistant. Carbon blades are known as sharper, but I see no significant difference because my stainless blades are very sharp. Another area where the material plays a big role is the maintenance. If you choose stainless shears, you will also save some extra money. If you want to get the best out of your kitchen shears, you should think about the size and material of the handles. The best materials for the handle are plastic and rubber. With them, you will be able to cut foods fast and efficiently, without any discomfort and possibility of them slipping from your hands. For full control over your shears, the size of the handle should fit your hand comfortably. If you are left-handed, you'll need to pay particular attention to the handle design, but today many shears are ambidextrous. Most shears are not dishwasher friendly (even though some manufacturers claim theirs are), but when it comes to maintenance, this is the least of your problems. The shears' design must allow thorough washing, especially after cutting meat to avoid developing bacteria and odors. It is best when it is possible to remove the bolt so that the blades could be washed evenly. Blades should be able to ﻿sharpen﻿ nicely, but they shouldn’t require frequent sharpening. There are also some shears with replaceable blades. As for the safety, it is imperative that shears have a tight mechanism, so the blades don’t separate during the usage. I had an accident while I was preparing the turkey; while I was cutting, out of nowhere, the blades of my shears have separated. I was lucky that my fingers stayed in one piece. When it comes to chicken or turkey, I almost can't imagine preparing them without kitchen shears. With the help of this utensil, I can do it all by myself in a short time and with little energy invested. If you like to prepare roasted/grilled chicken or turkey, kitchen shears will make it easy to remove the spine or cut bones, cartilage, and joints. Compared to a knife, kitchen shears will provide you with more control while you are cutting the bones or removing the spine, thanks to their neat design. If these are the tasks where you will use the shears the most, you should choose shears with sharp blades and easy-grip handles, which will allow you to cut the bones without additional and unbalanced pressure. Besides chicken and turkey, I use kitchen shears to cut beef or bacon into thin slices, especially when I want to stir-fry the meat. Also, if you like to make stews or even kabobs, this kitchen tool will help you prepare the finest slices of meat. You can use it to trim the fat off the meat. I do this all the time for my younger son (he can't stand a bit of fat). Using kitchen shears, I can cut different kind of vegetables like a true professional. I don’t even think about using a knife when it comes to preparing a salad. Cutting green salad, cabbage, tomato, green onions, chives, carrots is easier than ever. Also, I use kitchen shears when I prepare green beans or asparagus. The thing that I like the most in using kitchen shears for cutting herbs and vegetables is that I can do it without a cutting board. I just simply slice the veggies directly into a bowl. 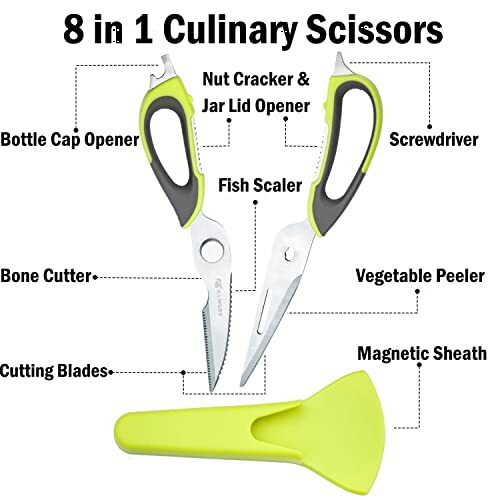 Believe it or not, kitchen shears can be used for opening jars and cracking nuts or shells. My husband is always talking me into buying kitchen shears with the bottle opening feature. And my older son always uses my kitchen shears to cut the crust from a pizza. He says that that is the best way to do it, because there's no messy chopping, and everything stays in the same place. 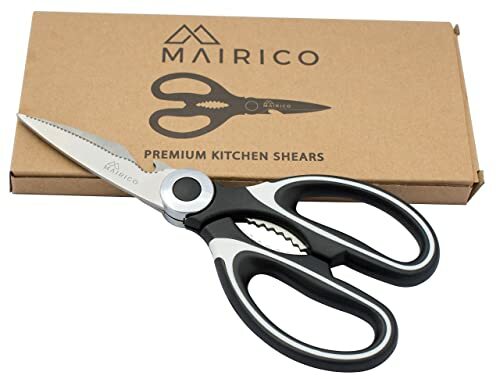 I was amazed when I found out that these kitchen shears have a lifetime warranty, meaning that you are not satisfied with them, you are free to return them, and you will get your money back. 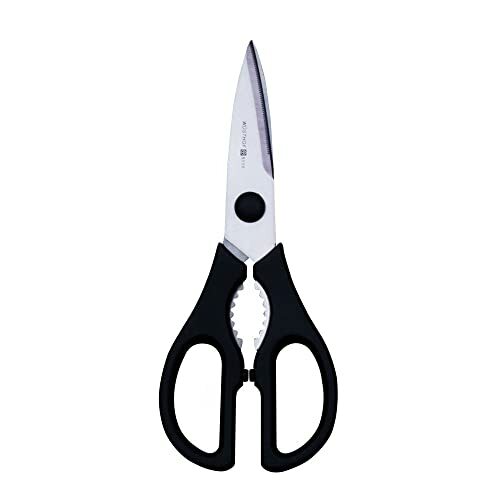 These shears won the best multi-purpose utility scissors for Chicken, Poultry, Fish, Meat, Vegetables, Herbs, and BBQ'sAward. I tried them almost on everything. I’ve cut chicken, fish, turkey, shells, bacon, different kind of herbs, and I it was almost perfect every time. Thanks to sharp stainless-steel blades with micro-serrated edges and easy-grip handles, cutting almost anything is simple and fast. Another thing that I liked is that both my husband and I can use these kitchen shears. They are adapted to right-handed and left-handed people. Also, my husband likes that these shears have a built-in bottle opener. I'm satisfied with this feature too because I can use it for opening jars and cracking nuts. However, although near to perfection, these shears are not without their flaws. One of the most annoying is that they can’t be disassembled for thorough washing, and there is a lot of chance for dirt and residues to get in the area between the blades and around the bolt. Also, they are not suitable for sharpening. These are simple kitchen shears, but sometimes, simple is everything you need. Stainless steel makes the blades rust-resistant, but I wasn't pleased with the sharpness. After a few weeks, they weren’t cutting well at all. I tried to remove the spine of a rabbit, but it was useless. At first, I liked that the blades have micro-serrations for enhanced cutting performance and are extra thick for added strength and durability. I made a lot of delicious meals thanks to the Kitchen Aid shears, but they didn’t keep their performance for long. I was very pleased with handles; they are comfy to hold and have a soft-grip coating that enhances stability. I didn’t have a problem with controlling the shears while cutting poultry. Like the previous product, these shears too can't be disassembled. They need to be washed immediately after use to prevent some food residues to remain stuck. Although they are sold as dishwasher safe, it is better to wash them by hand. I love that they came with a protective plastic blade guard. This protects them from rust and makes them safer if you have a little child. The first thing I noticed about these shears is the design. I like it because it shows multifunctionality – WISLIFE Kitchen Shears offer eight different functions. I particularly liked how easy it is to set them apart. Finally, I found shears that can be thoroughly washed in a matter of minutes. When you take them apart, you get two separate blades which can be used as knives. One blade is good for cutting vegetables, while the other is more suitable for cutting bones. The edge on the other side of the first blade is intended for fish, and surprisingly enough, it works perfectly. Bones were very easy to break, thanks to carbon stainless steel and the soft-grip handle. There is also a part of the shears which is designed to open the jar and bottles. On the very end of the handle, there is a screwdriver and a bottle cap opener. In the middle, you will find Nutcracker and jar lid opener. The shears come with a magnetic holder, which you will like if you have children. Overall, for the price, these shears offer a lot. One thing that can, but doesn’t have to pose a problem is the fact that the size of the handles isn’t suitable for people with larger hands. Unlike this small drawback, there is one major flaw of Wislife’s shears: the metal doesn't g through the handle, and it stops short of the loops. Because of this, I am not sure how hard I can push on these scissors without them snapping. The thing I liked the most about this model is its sharpness. The blades are made from carbon stainless steel and can be taken apart for sharpening and thorough washing. However, the blades come apart way too easily. The mechanism is weak and can set the shears apart while cutting bones. That can be annoying, and quite dangerous. Because of that, I use them mainly for cutting vegetables, herbs, paper, and cardboard. Again, as with the previously reviewed product, the handles are a bit tight for larger hands. The handles are made from synthetic plastic, and they are not prone to slipping. 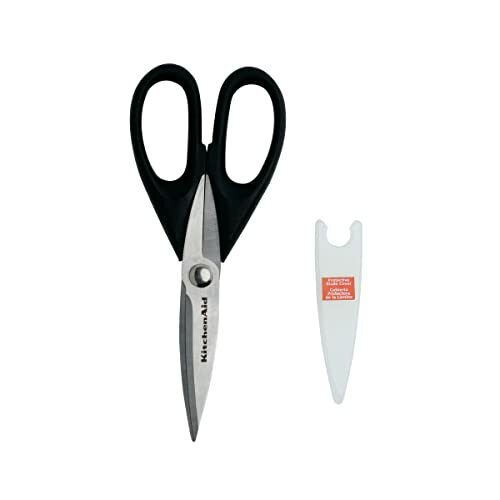 Both left and right-handed persons can use this pair of shears equally. The handles have steel-tooth inserts which can be used for opening jars and bottles. I have one big problem with these shears, the blades are much shorter than what I expected, and they really hurt my thumb and joint when cutting. The finger room is much smaller than in most other shears, so it is hard to get my grip properly. 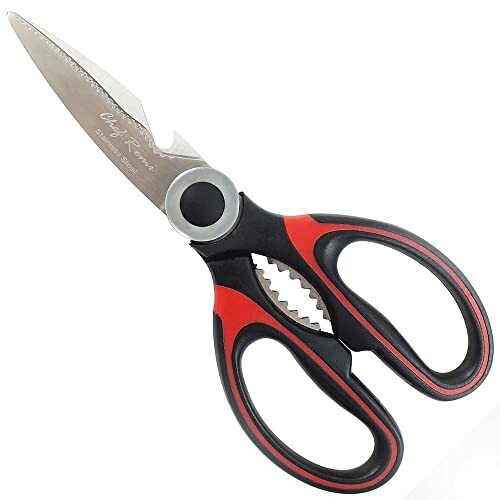 With this pair of shears, you won't get a protective guard for the blades, so if you have kids try to put them in a spot that they can't reach. Overall, they are decent but don't expect a lot from them. I liked this model very much. It has very sharp blades made from stainless steel, and it is obvious they’re built to last. They are easy to handle because their professional design makes them comfortable for using and easy for maintaining. These shears can be used both inside and outside of the kitchen. I used them for everything from cutting bones of poultry to trimming plants and cutting rose stems, and thy excelled at every task put in front of them. The handles are very comfortable to hold, and they are not slippery at all. Also, the handles are universal, so right and left-handed persons can use them. Still, there is one red light I can’t get over: they do not come apart, which makes cleaning that much harder. Also, after a few months, I've noticed rust stains on the blade, which is something I didn't expect considering the blades are made of what is supposed to be stainless steel. In the end, I must admit that each of these shears has their own unique advantages, and it would be best if I could join them all into one pair. However, the choice must be made, and after considering all the factors we’ve discussed in the buying guide and the performance of the shears while I was using them, I have to say that WISLIFE Kitchen Shears win hands on. They are simple to use, sharp and durable. They can come apart for easier washing and even turn into two separate knives which are very useful on their own. The Wislife’s pair of shears is very appreciated for its multipurpose, and it can be a real treasure to have in your household when you need ﻿﻿a﻿﻿ bottle opener, screwdriver, knife or just your regular old shears.